I’ve just attended a great presentation by Nicola and Alberto from UnLtdWorld.com. I’ll cover the presentation later but I took the opportunity to sit with Nicola in the wonderful Glastonbury themed garden (photos to follow) on the top floor of this building to find out more about the site. 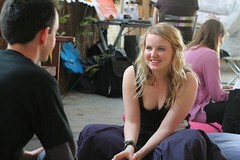 Nicola is a communications assistant with UnLtd but is the evangelist for UnLtdWorld. She is the first friend that people have when they join and is an intrinsic part and personality of the site. So what does that actually mean? Is it just another social networking site, albeit for a great cause? 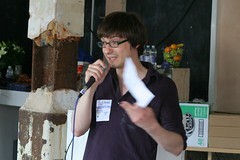 Since it opened in mid February 2008 the site has brought together all the UnLtd award winners and other social entrepreneurs in a well designed, functional and attractive community online. UnLtd supports social entrepreneurs – people with vision, drive, commitment and passion who want to change the world for the better. We do this by providing a complete package of funding and support to help individuals make their ideas a reality. Given that their member base consists of people who have actively sought funding for their projects already and won awards because of it, there’s a commitment and a hunger already there, but also a level of experience and expertise that people are willing to share and seek to learn from. Nicola, who’s 24 and from Manchester (her profile is here) is a passionate, empathetic and inspiring person. She is an ideal representative for the site and a committed Community Manager whose expertise and appeal lies in her personal, professional approach to members and her openess to laughter, smiles and fun. Her story and background matches the person in front of me – due to difficult personal circumstances at 17 she decided to start to make a difference. She describes a transformation from “typical selfish 17 year old” to someone who wants to make everything a bit more worthwhile. She moved to London for University and after a time with Goldman Sachs she “stumbled upon” UnLtd where she’s worked in a number of positions before assuming her present role. She finds the company very open to helping people work towards their own career progression, as well as being a fantastic place to work. Nicola’s seems exactly the type of person you need as a community manager. Describing herself as still a novice to the world of social networking (which she doesn’t see as the be all and end all, just a tool to help people connect) she finds herself enthused by UnLtd’s members – everyone from the award winners to the people who have book clubs about inspiring books or those who paint a wall to make people feel better about their environment. So, down to brass tacks. Does UnLtdWorld work? 110% says Nicola. From the first step of registration Nicola is added as a member’s contact, helping to make it easier for people still quite unsure about how it works. She’s delighted by how it’s helping people making links and getting connected. She tells me about the UnLtdWorld Scotland group which started with 3 people and is growing quickly with member connections, networking and discussions. She also tells me of member Roger who is blind, and finds UnLtdWorld the only social network he can use because it’s configured for screen readers and he uses it to exercise and communicate his passion about making the world a better place. Then there’s Dwayne from Sense Magazine who is a key connector on the site and seeks out people to help facilitate introductions and conversation. All voluntary, all contributing to help make it work. It also allows CEOs from major charities are accessible to fundraisers and start-up entrepreneurs looking for advice and help and contacts. It’s these type of things, she says, that makes her job worthwhile. On a personal note, I’ve worked with many sites with admirable aspirations who pump loads of money and staff resource into their site, only to miss the fact that it’s about people and not functionality and that the programming and code is rarely as important as the content and engagement by people through the site. Those sites ultimately fail, in respect of what they could have achieved. I was, therefore, surprised to learn that the total UnLtdWorld team is two developers, a part-time designer and then Alberto (the chief strategist), Nicola and Rachel, the Communications Manager. So why is it working – well this presentation goes into it but I’ll cover that in a later post. On an Irish perspective we have Ammado that seems to be striving to achieve what UnLtdWorld are doing already. Nicola’s personal passions and aspirations? She hopes to help bring UnLtdWorld to everyone by making it as accessible as possible to everyone – not just those internet savvy but to everyone who wants to make a difference. It’s about, she says, seeing someone develop their projects, making a difference and producing solutions to problems. She also speaks movingly about being inspired by the staff and carers at St Francis Hospice in Manchester, a charity offering the families of very sick children a respite from their role as carers and gives the children a loving home from home. She also loves doing the annual Cancer Research run, raising funds for and supporting cancer sufferers and their families. With people behind it like Nicola, I can see how it helps people to do just that. I’ve signed up (my profile is here) and I look forward to learning a lot more. I came to the Shine Conference hoping to be inspired. I definitely am.